This week's Bread Baker's Apprentice Challenge is Peter Reinhart's recipe for Pain l'Ancienne (which you can get from his book below, starting on page 191-194). 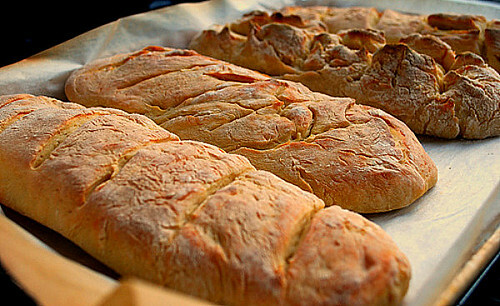 Friends joined me in the kitchen and together we prepared this super simple bread recipe. This baguette recipe consists of 5 ingredients... all of which I'm sure you probably have on hand (with the exception of yeast if you normally don't bake with it.) Combine, chill, warm and bake is all there is to it! The result is a delicious bread. It's amazing with cheese, jam, buttered or just plain as is, fresh out of the oven. I'll be the first to admit that I pick up Trader Joe's brand parbaked loafs on occassion, but now with this recipe, I no longer need to. I can whip it up at home for a fraction of the cost and have even better bread, along with the pride of knowing I made it myself! But wait, there's more... aside from baguettes, this recipe can also be used as pizza dough or even focaccia! Combine the flour, salt, yeast and water in the bowl of the electric mixer with the paddle attachment and mix for 2 minutes on low speed. Switch to the dough hook and mix for 5 to 6 minutes on medium speed. The dough should be sticky on the bottom of the bowl, but it should release from the sides of the bowl. If not, sprinkle in a small amount of flour until this occurs (or dribble in water if the dough seems too stiff and clears the bottom as well as the sides of the bowl). Lightly oil a large bowl and immediately transfer the dough with a spatula or bowl scraper dipped in water into the bowl. Mist the top of the dough with spray oil and cover the bowl with plastic wrap. Immediately place the bowl in the refrigerator and chill overnight, to retard fermentation. The next day, check the dough to see if it has risen in the refrigerator. It will probably be partially risen but not doubled in size (the amount of rise will depend on how cold the refrigerator is and how often the door was opened). Leave the bowl of dough out at room temperature for about 2 to 3 hours (or longer if necessary) to allow the dough to wake up, lose its chill, and continue fermenting. When the dough has doubled from its original prerefrigerated size, liberally sprinkle the counter with bread flour (about 1/2 cup). Gently transfer the dough to the floured counter with a plastic dough scraper that has been dipped in cold water, dipping your hands as well to keep the dough from sticking to you. Avoid punching down the dough as you transfer it, to expel as little as possible of the carbon-dioxide gas that has built up in the dough during fermentation. If the dough is very wet, sprinkle more flour over the top as well as under it. Dry your hands thoroughly and then dip them in flour. Roll the dough gently in the sprinkled flour to coat it thoroughly, simultaneously stretching it into an oblong about 8 inches long and 6 inches wide. If it is too sticky to handle, continue sprinkling flour over it. Dip a metal pastry scraper into cool water to keep it from sticking to the dough, and cut the dough in half widthwise with the pastry scraper by pressing it down through the dough until it severs it, then dipping it again in the water and repeating this action until you have cut down the full length of the dough. (Do not use this blade as a saw; use it as a pincer, pinching the dough cleanly with each cut.) Let the dough relax for 5 minutes. Prepare the oven for hearth baking, making sure to have an empty steam pan in place. Preheat the oven to 500 F, or 550 F if your oven goes this high. Cover the back of two 17-by-12-inch sheet pans with baking parchment and dust with semolina flour or cornmeal. Take one of the dough pieces and repeat the cutting action, but this time cut off 3 equal-sized lengths. Then do the same with the remaining half. This should give you 6 lengths. Flour your hands and carefully lift one of the dough strips and transfer it to an inverted parchment-lined pan, gently pulling it to the length of the pan or to the length of your baking stone. If it springs back, let it rest for 5 minutes and then gently pull it out again. Place 3 strips on the pan, and then prepare another pan and repeat with the remaining strips. Score the dough strips as for traditional baguettes, slashing the tops with 3 diagonal cuts. Because the dough is sticky, you may have to dip the razor blade, serrated knife or scissors in water between each cut. You may also omit the cuts if the dough isn't cooperating. Take one pan to the preheated oven and carefully slide the dough, parchment and all, onto the baking stone (depending on the direction of the stone, you may choose to slide the dough and parchment off the side of the sheet pan instead of off the end); or bake directly on the sheet pan. Make sure the pieces aren't touching (you can reach in and straighten the parchment or the dough strips, if need be). Pour 1 cup of hot water into the steam pan and close the door. After 30 seconds, spray the oven walls with water and close the door. Repeat twice more at 30-second intervals. After the final spray, reduce the oven setting to 475 F and continue baking. Meanwhile, dust the other pan of strips with flour, mist with spray oil, and cover with a towel or plastic wrap. If you don't plan to bake these strips within 1 hour, refrigerate the pan and bake later or the next day. The bread should begin to turn golden brown within 8 or 9 minutes. If the loaves are baking unevenly at this point, rotate them 180 degrees. Continue baking 10 to 15 minutes more, or until the bread is a rich golden brown and the internal temperature registers at least 205 F.
Transfer the hot breads to a cooling rack. They should feel very light, almost airy, and will cool in about 20 minutes. While these are cooling, you can bake the remaining loaves, remembering to remove the parchment from the oven and turn the oven up to 500 F or higher before baking the second round. Makes 6 baguettes, 6 to 8 pizzas, or one 17-by-12-inch focaccia. Heavily flour the counter and gently transfer the fully fermented dough from the bowl to the counter with a plastic scraper that has been dipped in cold water, dipping your hands as well to keep the dough from sticking to you. Remove the desired number of dough balls from the refrigerator 2 hours before shaping and baking your pizza as you always do. Line a 17-by-12-inch sheet pan with baking parchment. With floured hands, take the fully fermented dough from the bowl and continue with your focaccia-shaping instructions. Ferment at room temperature for about 2 to 3 hours, or until the dough rises and fills the pan, rising to about 1-inch thick. 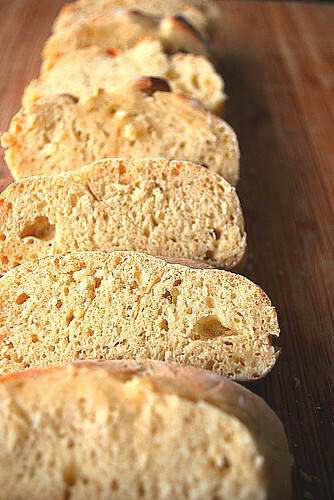 Continue your usual focaccia baking instructions. These look gorgeous and delicious! Thanks for posting the recipe. I've been on the look out for a new bread recipe that doesn't take all day. I do love that this recipe has only five ingredients! I love how this cooking challenge has helped broaden your skills!